For father's day, my wife and kids finished off my drawing supply collection in a hopefully non-futile attempt to get me drawing again. I also got something else though. 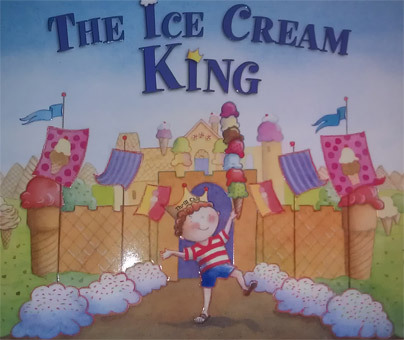 No, they aren't calling me the ice cream king, but this is a very cute book. It's written by Steve Metzger and illustrated by Julie Downing. It starts off as a black and white story about Teddy going to a scoop shoppe with his mom. He is transported to a colorful and wonderfully drawn world as he debates what he's going to order. I hate spoilers so I won't say anymore, but let's just say the book can be found here if you are interested (which you should be). I'm always surprised there aren't more ice cream books out there. I should hopefully have another iPad book review coming up very shortly, and who knows what else from there. Heck, maybe someday I'll even finish my own ice cream book, it's only been sitting on my shelf for what? 3 years? 4 years? oh I hope it hasn't been four years. It's cute too, maybe not as cute as this book, but I do wish I had the skills to finish it.